If you’re coming to Japan, forget maid cafes. Seriously. They’re overpriced and you can just look at the maids on the streets like everyone else does for free. You can also do this with a Tapioca drink in hand that you damn well know Ifrit spit a fireball into for about 600 yen if you take a detour and go to the Square Enix Cafe first. Regardless of whether or not fireballs are actually in your drink*, if you’re a fan of Final Fantasy, Dragon Quest, NieR or other big Square Enix titles, the Square Enix Cafe in Akihabara is worth a visit if you’re looking for exclusive merch that you won’t always find in other stores. It even is a restaurant with regularly changing themes and corresponding foods based on their games, such as Ignis’ recipes from Final Fantasy XV or the fish caught in NieR Automata. But these are more expensive and require a booking and well, do you really want to spend your money on a delectable dish that's price is the same cost as a Moogle plushie? Of course not! Thanks to the takeout menu, you can have a little Square Enix Cafe and your Moogle too. I’ve been trying the Square Enix takeout menu slowly but surely this year and what I’ve come to enjoy about it are the grand menu drinks, mainly because they’re around all year round and a majority of the time come with coasters of various Square Enix characters for you to take home. A big appeal of the grand menu is that it’s available for takeout, which is good since anyone can get takeout without a booking, it’s usually not too crowded and it’s open until 10:30pm, meaning you can stroll over almost anytime you’re in Akihabara. I usually like it as the perfect finisher to browsing things I can’t afford inside the Cafe and I usually still leave happy knowing that even though I’m not ready to fork out for the Ignis figure yet, I can still leave with a drink and a coaster. But are the drinks really worth it? Well, although I think it's somewhat better value than the aforementioned maid cafes, you don’t totally get what you pay for at the Square Enix Cafe and you kind of are paying more for the experience and the Square Enix name. But these drinks are pretty good and as a fan of gachas, I like their coaster system of getting given a random one from a set. There are two schools of thoughts you could have, one being that 500 or 600 yen (roughly $5 or $6) is expensive for a regular-sized drink with big ice cubes in it, or (the one I use for my own spending justification) that a cafe drink is usually around 300 yen (around $3) and a gacha is usually the same, so if you factor in the ‘coaster gacha’ you can kind of justify the cost. I personally try only get a drink from the Square Enix Cafe if they’re doing a coaster I like so that I can feel okay with spending that much for a drink and all the drinks and coasters I’ve gotten so far have made me feel okay with this. The grand takeout menu currently features four drinks: three milk with tapioca drinks and a juice. They're also not completely unique, with three out of four of these readily available probably in the many cafes in Akihabara and Tokyo at different price points. But that attitude won't win the coaster collection game and these drinks are more than drinkable; they're pretty nice and gave me a new appreciation of those strange tapioca beads I never understood. For your convenience and just because, here's a ranking and mini-review of each of the coaster vessels drinks. The nicely coloured Grape Juice may be simple, but is a perfectly refreshing ‘Diamond Dust’ to a hot day and I appreciated it on the Summer day I bought it. It's a very clear juice in colour and tastes very smooth when drinking it with a good grape flavour and although it's not freshly squeezed, it is nice. There is a reason I gave it the lowest ranking and it's not because it's bad or anything. It's just grape juice. Nice grape juice….But just grape juice. It's also probably the least unique thing in the drinks department and considering they're not even doing any blending work, it's extremely simple. But the simplicity could also be considered the beauty of it too, as there’s nothing like a fresh icy juice when you need it and it did remind me that grape is pretty nice in juice form. Japan's version of milk tea is something I enjoy quite a bit since being here, so know I mean it when I say this Tapioca Milk Tea is the best milk tea I've ever had. Milk tea is also arguably a simple drink; it's just milk and tea after all. But there's a certain balance of milk to flavour in all of the Square Enix Cafe’s drinks and this Tapioca Milk Tea gets it the most right. The tea flavour is smooth and an enjoyably moderate level of strong and the milk blends perfectly with the tea, making a really tasty tea drink. 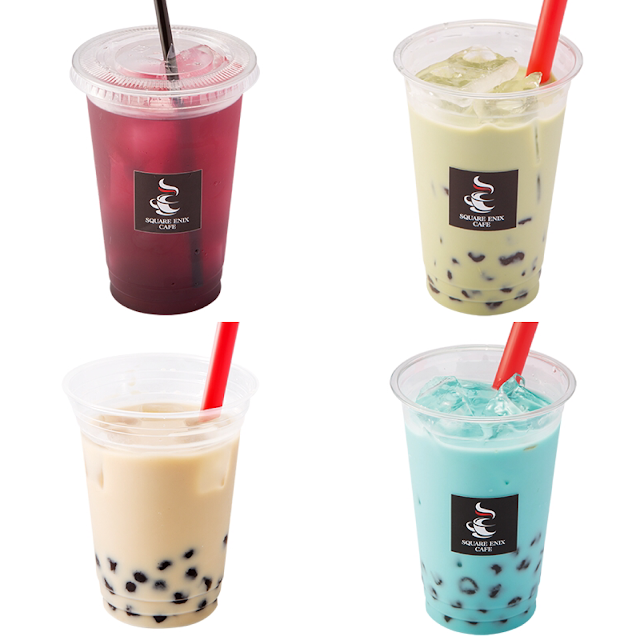 Speaking objectively, the Tapioca Milk Tea may in fact be the best drink of the Square Enix Cafe Takeout Menu. 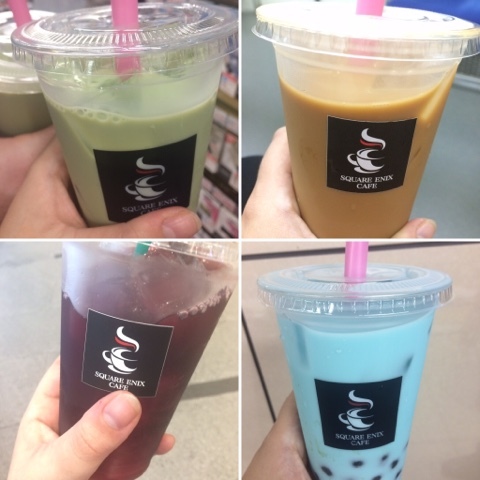 The tapioca, tea and milk flavours suit each other very well and I can see why a lot of the milk tea places have this kind of drink as their main drink. If you want to try this kind of drink for the first time, this is probably a good safe one to start with. As a fan of black tea and matcha, the battle between the Tapioca Milk Tea and Tapioca Matcha Milk is more of a personal one, since if I'm presented with a cold matcha drink or cold milk tea drink, I will usually pick matcha. The Square Enix Cafe menu is no different, even if I think the Milk Tea drink is objectively better. The Malboro-green tinged drink is a softly matcha-flavoured, with a little more milk than it has matcha. The tapioca fits in really nicely thanks to the milky-ness of the drink, even if I personally prefer a little more matcha in my matcha drinks. However, this is still one of the drinks I get the most at the Square Enix Cafe as I can rely on it for a good matcha hit when I need one and is a popular choice for when I go with other people too. If we’re talking about Square Enix as a brand and as a game developer, the Tapioca Blue Raspberry drink is the one I consider the most unique and Square Enix of them all. This drink was released around the time of Dragon Quest X’s release when the Cafe changed its sign from white to blue presumably because of Dragon Quest’s Slime character and so whenever I buy this drink, I always associate its pretty light blue with Slime and Dragon Quest. It is worth noting that there are themed drinks inside the cafe, but this takeout drink makes me feel like I really am getting a small piece of the Square Enix Cafe rather than a milk tea shop that just happens to give out Square Enix coasters. This drink also has a really unique flavour. After all, how many cafes can you say you’ve got a Blue Raspberry drink from? The Blue Raspberry flavour itself isn’t what I would call a ‘raspberry’ as I get more of a blueberry yogurt vibe from it. But I really like blueberry yogurt and drinking it was better than I imagined, especially with the tapioca touch that I’ve strangely come to associate with the cafe. On an objective level, I think it’s close in quality to the matcha drink, so whether your milk palette is more Slime-y or Malboro-y is really a matter of personal preference. For me, I really like the fact it represents Square Enix well while still tasting very good and it's what I consider the most quintessential Square Enix drink on the takeout menu. * Note: It’s probably worth noting that Square Enix doesn’t say Ifrit spits flame balls into their drinks. I made that up (unless they do in Japanese...In which you go Square Enix!). Same with most of the Square Enix character qualities I used to describe these drinks. 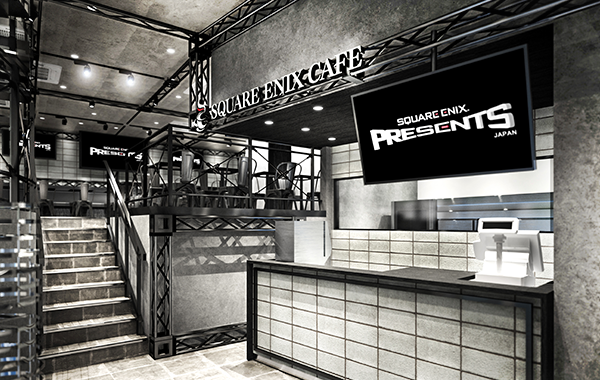 Do you want to try the Square Enix Cafe someday? Does the idea of consuming a fireball from Ifrit appeal to you? Hi, would you happen to know if one can simply go check out their store area without booking? (Since I don't necessarily need to have a meal there but would love to check out their merch) Thanks in advance!